♥This simple, yet classic pet sympathy bracelet is made with 8 mm white turquoise beads accented with zinc alloy paw charm and heart charm. White Turquoise signifies peace, love, happiness and holiness, it means everything will go smoothly for your beloved pet in heaven. ♥The special bracelet is a fantastic remembrance gift for people who have lost a beloved pet, a wonderful reminder of those great times together and a general support for animals. It also brings much comfort to people at a sad time in their lives. ♥♥A PERFECT SYMPATHY GIFT- This one of a kind memorial bracelet makes a great gift and remembrance for a loved one who has recently lost a pet, in loving memory of all of our faithful animal companions who have crossed over to the Rainbow Bridge. ♥♥FUREVER IN HEART - Your beloved pet left paws in your heart. The bracelet you wear everyday reminds you that even though your 4 legged best friend is no long by you side physically but always in your heart. ♥♥A SYMBOLIC MEANING - 1 Paw Bead symbolizes the paw prints they left on your heart ; 1 Heart Bead symbolizes the piece of your heart they took with them; 22 White Turquoise Beads symbolizes all the beautiful times you had with them. ♥♥BRACELET COMPOSITION - The 8mm white beads is natural stone called white turquoise , made of howlite; both paw & heart charm are made of environmentally friendly zinc alloy. This Memorial Bracelet = 8'' stretchable cord - One Size Fits Most. 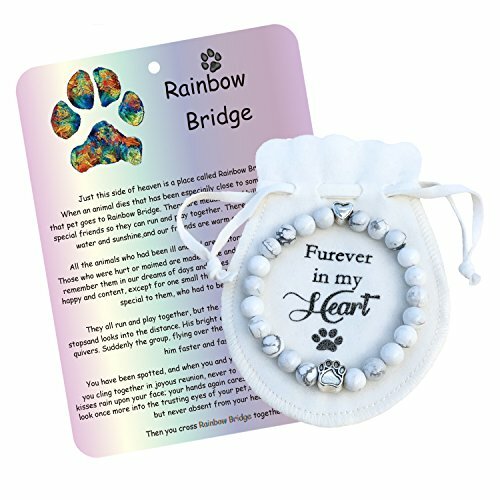 ♥♥PACKAGE INCLUDED - Each bracelet comes in a velvet drawstring bag, with a Rainbow Bridge Memorial Card in an envelope sealed with a randomly cute sticker, ready for gift-giving. If you have any questions about this product by A.B.C., contact us by completing and submitting the form below. If you are looking for a specif part number, please include it with your message.